Chinese pietersite is known for its earth tone colors with hints of reds and blues. Pietersite is related to tiger-eye forming in brecciated (broken up) patterns which creates stunning arrays of chatoyant colors. Pietersite is known as the tempest stone because of its strong energy that clears negativity and brings dramatic changes to your life. Pietersite activates the third eye enhancing your intuition. In addition it assists you to trust your intuition and move with it instead of resisting it. Its energy enhances thought processes, helping you pull different strands of information together into a cohesive whole. It is an excellent assistant for students and researchers alike. 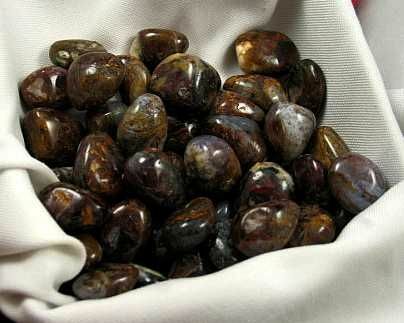 Pietersite also stimulates the physical body strengthening the nervous system, including the brain. Pietersite is also known as the tempest stone. It has been said to hold the "keys to the kingdom of heaven" dispelling illusion and assisting you to recognize of the beauty of the soul. It brings the potential of the individual to the perfection of the source of all being, stimulating dignified power and loving guidance. It promotes loyalty to the self and to the ultimate experience of life.